Mexico City Metro train on Line 4 at Consulado. Photo by Jorge Arturo Monzón Abarca, June 2009. Mexico City is one of the biggest cities in the world with a population of approximately 20 million inhabitants. Since 1969 it has been developing a subway system. 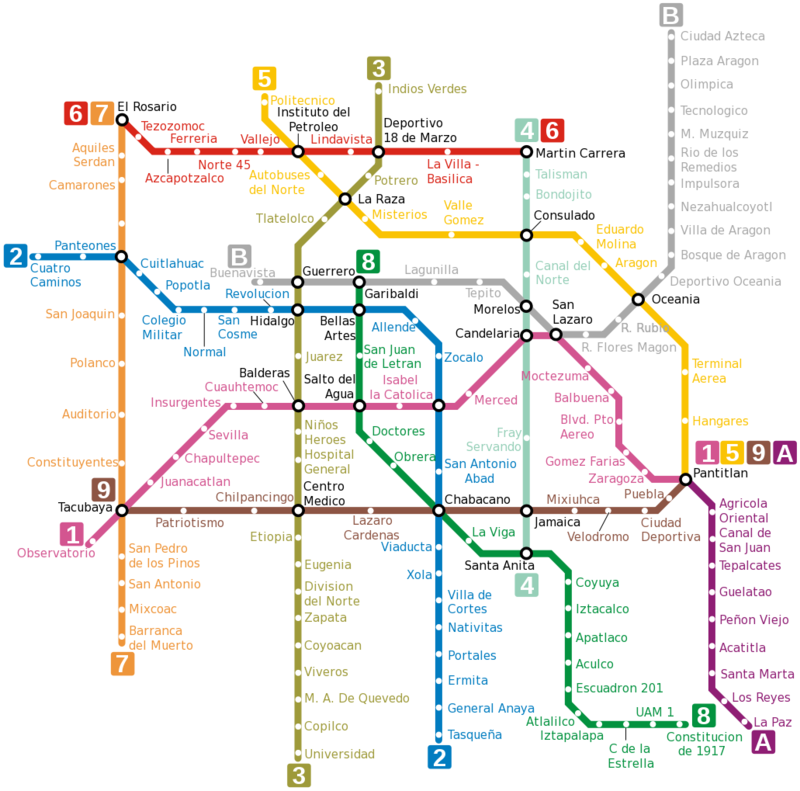 Now, Mexico City has 11 subway lines with a total length of 201.3 Km (125.8 miles) and 175 stations (106 in subway, 53 at grade, and 16 elevated). All the lines except Line A operate trains with rubber tyres like some lines in Paris and the subways of Montreal and Santiago, Chile. The Mexico City system, as well as those in the Mexican cities of Guadalajara and Monterrey, use symbols, as well as names, for identifying stations. Also in Mexico City there is a light rail line connecting the subway at the Tasqueña station (line 2) across the southeast of the city to Embarcadero station (Xochimilco), a length of 18.0 km (11.2 miles), with 18 stations all of them at grade. Also currently under construction is a "bus rapid transit," a bus line with independent right of way, along the Avenida Insurgentes crossing the city from north to south. Plans are in place for the construction of a suburban railroad (commuter railroad) in Mexico City from Buenavista to Cuautitlan de Romero Rubio in the northwest suburb of the city, connecting with the subway at Buenavista station (line B) and Ferrería sation (line 6). Buenavista is the former Central passenger railroad station of Mexico City. On June 1, 2008, a new suburban railroad line began operation from the Buenavista station in Mexico City northwest to Lecheria, a suburb in the "Urban Area" of Mexico City. Known as Ferrocarril Suburbano de la Zona Metropolitana de México (Suburban Railway of the Mexico City Metropolitan Area), its initial line is 18 km long and has 5 stations, and will be extended another 10 km, with 2 additional stations. The stations in operation are as follows: Buenavista (transfer with the Subway Line B Buenavista station and with the BRT Line 1); Fortuna (transfer with the subway Line 6 Ferreria station); Tlalnepantla; San Rafael; Lecheria (provisional terminal). The future stations are: Tultitlan, Cuautitlan. Service is operated every 6 minutes in peak hours and 15 minutes in non-peak hours. The line was built and operated by the Spanish railroad equipment builder CAF. The trains are "Model 447" EMUs built in Spain, and each train is made up of two units of four cars each. Each car can hold 225 people (seated and standing), with a total capacity per train of 1800 people. There are plans for further extension of this line from Cuautitlan to Huehuetoca (18 km) and a branch from Lecheria to Xaltocan (19 km). 1 18.8 Km (11.8 miles) 20; 19 underground and 1 at grade. 2 23.4 Km (14.6 miles) 24; 14 underground and 10 at grade. 3 23.6 Km (14.8 miles) 21; 17 underground and 4 at grade. 4 10.7 Km (6.7 miles) 10; 2 at grade and 8 elevated. 5 15.7 Km (9.8 miles) 13; 4 underground and 9 at grade. 6 13.9 Km (8.7 miles) 11; 10 underground and 1 at grade. 7 18.8 Km (11.8 miles) 14; 13 underground and 1 at grade. 8 20.1 Km (12.6 miles) 19; 14 underground and 5 at grade. 9 15.4 Km (9.6 miles) 12; 8 underground and 4 elevated. 12 24 Km (15 miles) 20; 9 underground and 11 elevated. A 17.2 Km (10.8 miles) 10; 1 underground and 9 at grade. B 23.7 Km (14.8 miles) 21; 6 underground, 11 at grade and 4 elevated. This map image is a file from the Wikimedia Commons. It is in the public domain. By Jorge Arturo Monzón Abarca.